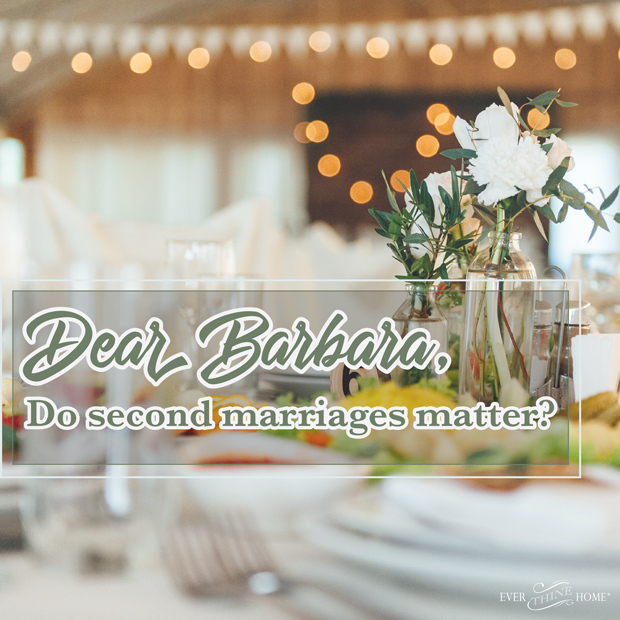 Dear Barbara, Do second marriages matter? You talk so much about staying together and making marriage work. What if my first marriage didn’t and now I’m trying again. Can I honor God with a new marriage? I appreciate the honest question. 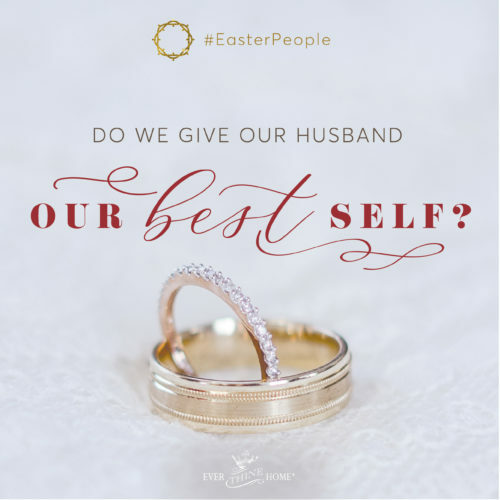 Since we added an official ministry to step families several years ago here at FamilyLife, we receive a lot of comments on both sides of this question. Many have asked how we can be for blended families, second marriages, and subsequent families if we are against divorce. Especially since God is so adamantly against divorce. It’s a fair concern if we look only at what God is against. So instead of starting with what God hates, let’s go to the beginning and look at what He is for. God designed marriage. It was His grand idea. Therefore, He is for marriage. The reason He is so against divorce is because He loves marriage and what it represents so much! So I’ll let you help me answer your question, “Do second marriages matter?” by asking another question. “Does marriage matter?” YES! Resoundingly yes. And since marriage matters, every marriage matters: first marriages, remarriages, second marriages, subsequent marriages. Every marriage matters to God. So if you’re in a wedded covenant relationship with your spouse and God, then your marriage matters. Your current covenant is held in absolute equal honor, value, and esteem as any marriage covenant. Ron Deal, head of FamilyLife Blended, says many in second marriages feel like second-class citizens. That’s not what God intends. 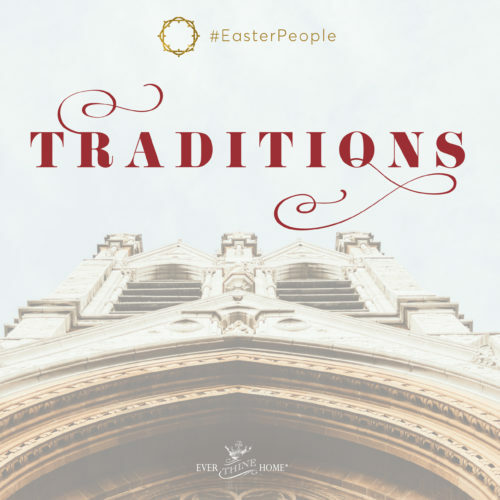 Ron suggests that even though you may not live in an “ideal” family configuration, Christians in stepfamilies certainly aren’t second-class Christians in God’s kingdom. In our own way, each of us has fallen short of God’s glory, and each of us needs His grace. God’s plan of one man and one woman in marriage for life does bring greater harmony to the home, but living in an intact family does not determine worth in God’s eyes, nor ability to receive God’s forgiveness. To prove it, let’s look at one stepfamily found in the Bible. Look at Abraham. He lied on two occasions, saying Sarah wasn’t his wife. He was afraid for his life so he publicly disowned her. As women living in a multiple-marriage household, Sarah and Hagar fought over which of their sons would be the most important in Abraham’s family. 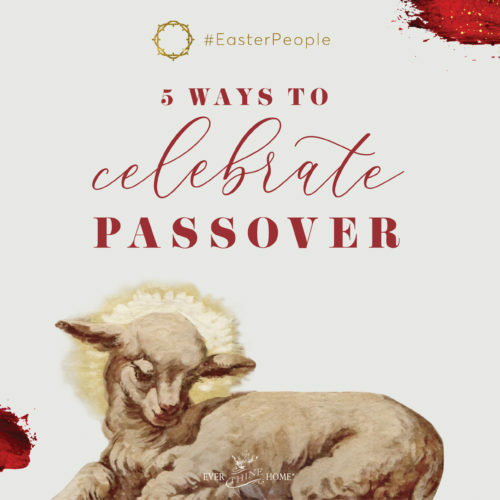 Much like a modern-day stepfamily, there was jealousy, bitter rivalries, and loyalty conflicts between Abraham and his two wives (see Genesis 16 and 21). And the problems didn’t stop with his generation. If we analyze the families of Abraham, Isaac, and Jacob, often referred to as the Family of Promise, we see power struggles, family secrets, exploitive and coercive relationships, marital game-playing, manipulation, and parent-child alliances for selfish reasons. Apparently, according to these stories God wanted us to know about in His Word, you can have a less-than-ideal family and still be acceptable to God. Ron draws the obvious conclusion: God loves stepfamilies and the individuals who live in them, too. There are no second-class citizens in God’s kingdom simply because there are no first-class citizens. Equally, there are not important marriages worth fighting for, and unimportant marriages that don’t matter because others didn’t work out. We’re all just sinners in need of a Savior. If God could use imperfect men like Abraham and David with complicated family households for His purposes, why can’t He use people in stepfamilies? If God can bring redemption to the houses of Isaac and Jacob, can’t He bring redemption to yours? The exciting message of the cross is this: God loves and forgives the imperfect people in stepfamilies and subsequent marriages just like He loves and forgives the imperfect people in first marriages with biologically intact families. Do you know another reason second marriages matter? They model marriage to the next generation. Even if a first marriage failed, this marriage can last. You have a renewed chance to leave a legacy of commitment and family health for your children and grandchildren. Preventing redivorce and strengthening stepfamilies to improve the environment in which the children grow up in is proven to positively impact future generations. Children from healthy stepfamilies have healthier attitudes about marriage, make better choices, and are more likely to remain in one marriage for life. All it takes is one generation and the generational cycle of divorce is broken to redeem a family legacy. Again, be assured. Your second marriage matters: in covenant to God, to your own personal health, to the future history of your family. We’re here to help you make your marriage last. For more, check out Ron Deal’s post God Loves Stepfamilies Too. Go to a Weekend to Remember. For me, marriage is marriage and it is sacred. Society, even the Christian community to some extent has put a tremendous amount of energy into defining divorced people, step this, blended that and giving us books and books and internet opinion after internet opinion of excuses to not do things biblically because of the “different” situations we find ourselves in or the “unique” emotions we feel when, really, His Word is His Word and His Word is what offers all of His children peace and joy. God gave us a book that takes us from His creation of the Heavens and the Earth, of Adam and Eve, through Christ’s return … it’s relevance, application and instruction is steadfast regardless of our past or future circumstances, who we were, are or will become. We are our spouse’s spouse, parents to our “step” children and the Bible doesn’t tell us we are any less of that, or obligated to any less than that when we choose to commit, though again, to getting it right. If anything, I feel a 2nd marriages is an opportunity for Gods grace to shine and give everyone, especially the kids a 2nd chance opportunity to experience God’s original plan – just gotta let go of the past and fully commit for your family’s sake, not what every one else thinks. I am praying for u all. There is so much pain. But, I simply love Barbara Rainy & her heart for the Lord in her posts. Keep up the good work-ETH. Thank you, Barbara. Your article touched my heart more than usual this week. I am divorced, as is my now husband. We work very hard to not make the same mistakes of our pasts. We work to lead our blended family as best we can with all the factors and influences, but with God as our guide. As you can see there is much disagreement and much judgment even among believers on this topic. I know you’re well versed, well studied and led by the spirit in your work. I do appreciate your wisdom and guidance for those of us in this situation. I will say that my husband and I have had a rough time plugging in at a church. Feeling judged because your life doesn’t look how everyone likes it to look makes things challenging. Some readers would say that is deserved because of our situation. My response is where is our God in that? He loved all, the worst of the worst the dirtiest of the dirty. None of us is any better than those. Your sin just looks different, not less than. This kind of judgment is what keeps others from truly knowing Him as they should. It keeps people tied in self punishment and trying to earn a grace that cannot be earned. I just wanted to say there are faces to these families. Husbands and wives who can still leave legacies of positive results, children who are still beautiful and able to do better than their parents; people capable and worthy of the love of a Lord that none of us deserved. Try to see all of these through God’s eyes. Thank you, Barbara. Your blog is a wonderful light, and I look very forward to each entry! And Jesus also said that anyone that looks at a woman with lust has already committed adultery. Anyone that hates his brother has committed murder and the bible says that murders will not inherit the Kingdom of God either. So I guess no one will get to heaven? The new covenant of God gives us the opportunity to be forgiven. Yes, God does not change, he is the same now and forever but you have left out several very important scriptures in your reference. No one can ever judge. Many people stop going to church because they have an image of God that he is not ever-loving and ever-forgiving. I say read the Word of God and he will direct your paths. Very well said. Wonderful comment. God Bless you and your family! Very painful story. I hope you find peace. I hope Gods love overtakes the bad memories. All of us are sinners, I believe He wants healing for all, and He knows we are human and imperfect. Even remarried, divorced or adulterers can find forgiveness. This debate will be as frustrating as the ProLife vs. Pro Choice debate. There will never be agreement or lack of division despite the absolutes. Thank you for this thoughtful article. What many will miss is buried in the middle paragraphs. “In our own way, each of us has fallen short of God’s glory, and each of us needs His grace. I am a product of God’s grace. The church spends way too much time defining sin and creating rules and far too little time serving those who need to know Christ. Rather than casting stones and legislating judgement, the Church needs focus on and grasp the concept of serving the body and being the hands and feet of Christ. It becomes very difficult to disparage those we serve and those we come alongside in life’s trenches. Grateful for Grace and Jesus! See you all on the other side rejoicing in Him. Thank you for your article…very informative and appreciated. I have not experienced divorce in my life, I am a very strong believer in the sacred institution of marriage that God created. In my own opinion there cannot possibly be divorce among believers because if both parties are true believers in Christ Jesus and have completely surrendered their lives, they believe wholeheartedly in the Holy Word and most of all love the Lord totally-divorce among believers is not an option. That’s nice. So, if a violent conman, who maquaraded as a believer manipulated a marriage out of some sweet innocent girl who didn’t know that people could be so evil and conniving is being battered and sexually scared for life you are saying it is never acceptable for her to break out of the abusive cycle? Including for her daughters sakes who are Ask I bring sexually, mentally, emotionally, verbally, and otherwise scarred for life? Thank you for your question. There are certainly steps to take for safety and reconciliation. We would never advise anyone to stay in a harmful situation for themselves or their children. While God’s plan for marriage isn’t to end in divorce, equally neither is it to be in an abusive situation. You can find practical steps we recommend for anyone in this difficult circumstance here http://www.familylife.com/articles/topics/life-issues/challenges/cultural-issues/responding-to-physical-abuse. Keyescor, I think you answered your own question. If a conman masqueraded as a believer then he is not really a believer and has not fully surrendered his life to Christ. When you truly surrender to Christ, yes you do still make mistakes, but you ultimately want to live a life that pleases God. And when you find those areas that aren’t pleasing to God, you acknowledge your weakness and ask God to help you then seek pastoral or professional help when appropriate. I’m beginning to think that we use the phrase “God ordained marriage” too loosely. The article said it best, the reason God loves marriage so much is because of what it represents. If your marriage does not represent God, then are you really in a “wedded covenant relationship with your spouse and God”? And I’m not talking about perfect marriages, I’m talking about marriages where you both put God first then work on everything else together as one. let me start by saying, if you marry for the second time not knowing that it is wrong then God consider it. but, if you divorce and marry, that is against God’s will. god hate divorce and He further say if you divorce for whatever reason, you ought not to marry again; you should remain single. you can only marry your spouse again if s/he is also still single, but s/he marry while you are single, you can no longer marry him/her again, then you will be single until that spouse dies. I find it annoying that ever second marriage is a result of divorce. What those of us who have remarried after being widowed? You’re right, Marcy. A second marriage for any reason relates to the message in this post: it’s a marriage that absolutely matters and is worth holding fast to the new covenant you’ve made. This post was written in broader response to the specific question submitted by someone who was in a second marriage due to both her and her spouse being formerly divorced. Thank you for pointing out that there are multiple paths to a subsequent marriage, none easier than others. And every new marriage commitment is a new chance to honor God’s good idea and plan for marriage. Abraham and Jacob are not examples of divorced and then remarried. Both men were married and multiplied wives. Abraham put Hagar and Ishmael out (God initiated) and Jacob didn’t put any either out wives out or away. Abraham remarried after Sarah died (Keturah) and had more children. And David multiplied wives too. His father in law (King Saul) married his wife off to another (Paltiel) and David retrieved her after Saul’s death. After her actions in 2 Samuel 6 – David didn’t go into her again – but they were not divorced. Second marriages are not second-class. But there are some careful considerations when you are dealing with believers. My believing husband of 24 years divorced me (and destroyed our family) because his adulterous relationship with a women he supposedly led to Christ meant nore than the wife and family God gave him. They live together today with their child (born while he was still living at home with us). Nothing blended about that. This relationship is not the circumstance of 1 Corinthians 7:12-16. My husband was a widow and divorced before he came to Christ. His former wife didn’t want anything to do with Jesus Christ and him. It was with much prayer, the Word and pastoral counsel and guidance before we married. I have chosen not to remarry. I don’t like it and I have no guarantees of reconciliation (if the Lord wills, it will happen and I am open to this) but if not, if husband passes away before I do, then I can (if I choose to) remarry, as the commitment is done at death. Here comes the rocks and all from folks, but I take what the Word of God says seriously and thoughtfully and not lightly. God said it, I believe it and that settles it for me. Please find another example from the Word of God. I think after this post I will withdraw from participating in this blog. Tona, Thank you for your comment. I’m deeply sorry about the pain you’re experiencing as a result of your husband’s sin. I understand your desire to wait to remarry. What a faith statement to be willing to continue in prayer for your husband and be open to reconciliation. We regularly pray for the requests of those in our blog community. We will be praying with you for peace for you and your family and reconciliation. Hugs. My friend has fervently prayed that his eyes would be opened, that their family would be reconciled and believes she received a word from God to persist with praying for this. Her husband and the girl married about a year ago and she continues to pray and believe. His girls didn’t go to the wedding and he misses them terribly. What do you think about this situation Barbara? This wedding was born out of lust and sin…. My heart aches hearing about what your friend has endured. I can agree that this would not be God’s plan for how the marriage played out. I respect your friend for choosing to continue praying for her former husband. But now it’s true that he has entered a new marriage covenant. I know it must be heartbreaking for the children. Although the original marriage has dissolved, there is still repentance, forgiveness, and reconciliation possible for him and his children. Hugs to you as you support your friend through this difficult process. Thank you, Barbara, for your redemptive response. I am part of a Stepfamily, and have been so for 30 years. We are great believers in the Family Life Blended path that Ron Deal is guiding. We have facilitated his, The Smart Stepfamily, in our church, and will do that again. God is a Redeemer of circumstances, as well as a Redeemer of persons! Yes, your writer’s second marriage matters!